Bu çalışmada piridin-2,6-dikarboksilik asitin (H2dipic), N-metilpiperazin (Meppz) ile reaksiyonundan proton transfer tuzu (H2Meppz)(Hdipic)2 (1) elde edilmiştir. Elde edilen proton transfer tuzunun (1) Ni(CH3COO)2.4H2O ve Cu(CH3COO)2.H2O ile reaksiyonundan ise metal kompleksleri [Ni(H2O)6][Ni(dipic)2]. (Meppz).5H2O (2) ve (H2Meppz)[Cu(dipic)2].2H2O (3) sentezlenmiştir. Proton transfer tuzunun (1) yapısı FT-IR, 1H ve 13C NMR, ve UV-Vis spekroskopileri ve elementel analiz teknikleri ile aydınlatılmıştır. Komplekslerin yapıları ise FT-IR, UV-Vis, ICP-OES, manyetik duyarlılık ve elementel analiz yöntemlerinden elde edilen verilere göre önerilmiştir. In this study the proton transfer salt (H2Meppz)(Hdipic)2 (1) was obtained by the reaction of N-methylpiperazine (Meppz) with pyridine-2,6-dicarboxylic acid (H2dipic). The metal complexes [Ni(H2O)6][Ni(dipic)2]. (Meppz).5H2O (2) and (H2Meppz)[Cu(dipic)2].2H2O (3) were synthesized by the reaction of proton transfer salt (1) with Ni(CH3COO)2.4H2O and Cu(CH3COO)2.2H2O. The structure of proton transfer salt (1) was characterized by 1H and 13C NMR, FT-IR and UV-Vis spectra and elemental analysis techniques. The structures of the complexes have been suggested according to data obtained from FT-IR, UV-Vis, ICP-OES, magnetic susceptibility and elemental analysis methods. Mautner, F.A., Albering, J.H., Vicente, R., Andrepont, C., Gautreaux, J.G., Gallo, A.A. and Massoud, S.S., (2013), Synthesis, structure and magnetic investigations of polycarboxylato-copper (II) complexes, Polyhedron, 54,158-163. Mautner, F.A., Albering, J.H., Corbella, M. and Massoud, S.S., (2011), A uniqueunit cell containing simultaneous doubly and triply copper(II) complexes bridging by 2,4-pyridine dicarboxylate, Inorganic Chemistry Communications, 14, 702-705. Van Albada, G.A., Ghazzali, M., Al-Farhan, K., Bouwman, E. and Reedijk, J., (2011), Three new pyridine-2, 6-dicarboxylate copper (II) compounds with coordinated pyridine-based ligands: Synthesis, characterisation and crystal structures, Polyhedron, 30, 2690-2696. Wang, Y.-L., Zhang, N., Liu, Q.-Y., Yang, X., Bai, H., Duan, L.-Y. and Liu, H.-Y., (2011), Iono thermal syntheses and crystal structures of two cobalt (II)–carboxylatecompounds with different topology, Inorganic Chemistry Communications, 14, 380-383. Massoud, S.S., Louka, F.R., Nguyen, L.T., Mikuriya, M., Albering, J.H. and Mautner, F.A., (2011), Structural and magnetic characterization of 1-D complexes constructed from pyrazole-3, 5-dicarboxylate bridging multi copper (II) centers, Inorganica Chimica Acta, 366, 394-398. Mautner, F.A., (2010), Structural and magnetic characterization of a novel series of dinuclear Cu (II) complexes bridging by 2, 5-pyrazine dicarboxylate, Inorganica Chimica Acta, 363, 1001-1007. Günay, G., Yesilel, O.Z, Darcan, C., Keskin, S. and Büyükgüngör, O., (2013), Synthesis, crystal structures, molecular simulations for hydrogen gas adsorption, fluorescent and anti microbial properties of pyrazine-2, 3-dicarboxylate complexes, Inorganica Chimica Acta, 399, 19-35. Taşcıoğlu, S., Aydin, A., Yalçin, B., Kaki, E., Andaç, Büyükgüngör, O. and Kosar, B., (2011), Synthesis and characterization of Cu (II) complexes of pyrazine-2,3-dicarboxylicacid, Polyhedron, 30, 2171-2180. Ma, T., Zhang, J., Jing, X., Feng, Q., Zheng, B., Yu, Y., Huo, Q. and Liu, Y., (2012), Construction of three lanthanide organic frame works with (3,5)-connected topology based on 2-methyl-4, 5-imidazole dicarboxylate and oxalate, Inorganic Chemistry Communications, 20, 201-204. Massoud, S.S.,Gallo, A.A., Dartez, M.J., Gautreaux, J.G., Vicente, R., Albering, J.H. and Mautner, F.A., (2014), Dinuclearcopper (II) complexes bridged by imidazole-4,5-dicarboxylate, Inorganic Chemistry Communications, 43, 35-38. Chen, B.I., Eddaoudi, M., Hyde, S.T., O’Keeffe, M. and Yaghi, O.M., (2001), Interwoven Metal-Organic Framework on a Periodic Minimal Surface with Extra-LargePores, Science, 291, 1021- 1023. Gu, Z.G.,Li, G.-Z., Yin, P.-Y., Chen, Y.-N., Peng, H.-M,. Wang, M.-F.,Cheng, F., Gu, F.-L., Lim, W.-S.and Cai, Y.-P., (2011), Temperature-induced two copper (II) supra molecular isomers constructed from 2-ethyl-1H-imidazole-4,5-dicarboxlylate, Inorganic Chemistry Communications, 14, 1479-1484. Lampeka, Ya.D. and Tsymbal, L.V., (2004), Framework materials based on azamacro cyclic complexes of transition metals and carboxylates Theoretical and Experimental Chemistry, 40, 345-371. Eshtiagh-Hosseini, H., Hassanpoor, A., Alfi, N., Mirzaei, M., Fromm, K.M., Shokrollahi, A., Gschwind, F. And Karami, E., (2010), Synthesis, X-ray crystal structure, thermal and solution studies of a centro symmetric metal–organic polymer based on proton transfer methodology, Journal of Coordination Chemistry, 63, 3175-3186. Das, B. And Baruah, J.B., (2011), Dipicolinato complexes of cobalt(II), copper(II) andzinc(II) with thiamine dications, Inorganica Chimica Acta, 372(1), 389-393. Soleimannejad, J., Aghabozorg, H., Mohammadzadeh, Y., Nasibipour, M., Sheshmani, S., Shokrollahi, A., Karami, E. and Shamsipur, M., (2011), Different complexation behavior of Fe(III), Co(II) and Ni(II) with pyridine-2,6-dicarboxylic acid and 4,4-bipyridine adduct: syntheses, crystal structures and solution studies, Journal of Iranian Chemical Society, 8(1), 247-264. Prasad, T.K. and Rajasekharan, M.V., (2010), Hetero metallic coordination compounds of dipicolinic acid with Ce(III, IV) and Cu(II): Synthesis, crystal structure and spectral studies, Inorganica Chimica Acta, 363(12), 2971-2976. Yenikaya, C., Büyükkıdan, N., Sarı, M., Keşli, R., İlkimen, H., Bülbül, M. and Büyükgüngör, O.,(2011), Synthesis characterization and biological evaluation of a novel Cu(II) complex with the proton transfer salt of 2,6-pyridinedicarboxylic acid and 2-amino-4-methylpyridine, Journal of Coordination Chemistry, 64, 3351- 3365. Fainerman-Melnikova, M., Clegg, J.K., Pakchung, A.A.H., Jensen, P. and Codd, R., (2010), Structural diversity of complexes between Cu(II) or Ni(II) and endocyclic oxygen- or nitrogen-containing ligands: synthesis, X-ray structure determinations and circular dichroism spectra, Cryst. Eng. Comm, 12(12), 4217-4225. Zhao, Z., He, X., Zhao, Y., Shaoand M., and Zhu, S., (2009), Coordination polymer based on Cu(II), Co(II) and 4,4'-bipyridine-2,6,2',6'-tetracarboxylate: synthesis, structure and adsorption properties, Dalton Transactions, 15, 2802-2811. Cui, S.X., Zhao, Y.L., Zhang, J.P., Liu, Q. and Zhang, Y., (2009), Structural and magnetic properties of metal complexes with pyridine-2,6-dicarboxylate and 5-(4-bromophenyl)-2,4'-bipyridine, Polyhedron, 28(5), 980-986. Aghabozorg, H., Sadr-Khanlou, E., Shokrollahi, A., Ghaedi, M. and Shamsipur, M., (2009). Synthesis, characterization, crystals tructures, and solution studies of Ni(II), Cu(II) and Zn(II) complexes obtained from pyridine-2,6-dicarboxylic acid and 2,9-dimethyl-1,10-phenanthroline, Journal Iranian Chemical Society 6(1), 55-70. Büyükkıdan, N., Yenikaya, C., İlkimen, H., Karahan, C., Darcan, C. and Şahin, E., ( 2013), Synthesis, characterization and antimicrobial activity of novel proton salt and its Cu(II) complex, Russian Journal of Coordination Chemistry, 39, 96-103. Chen, X., Wang, Y., Yu, J., Zou, Y. and Xu, R., (2004), (C6H17N3)[Zn4(PO4)2(HPO3)2]: a new layered zinc phosphate-phosphite templated by 1-(2-Aminoethyl) piperazines, Journal of Solid State Chemistry, 177, 2518-2522. Ciccarese, A., Clemente, D.A., Fanizzi, F.P., Marzotto, A. and Valle, G., (1998), Boat versus chair conformation in N-methyl- and N,N’-dimethylpiperazineplatinum( II) complexes studied by X-ray analysis. A rare example of metal chelate piperazine: cis-[PtCl2(Me2ppz)] Part 1”, Inorganica Chimica Acta, 275-276, 410-418. Marzotto, A., Clemente, D.A., Benetollo, F., and Vale, G., (2001), Piperazine (andderivatives) Copper(II) compounds: 1,4-dimethylpiperazin-1,4-ium tetrachlorocuprate(II) and Cu-N bond formation in trichloro(1-methylpiperazin-1-ium-N4)copper(II) and trichloro (1,4-dimethylpiperazin-1-ium-N4)copper(II), Polyhedron, 20, 171–177. Nawar, N. and Hosny, N.M., (1999), Transition Metal Complexes of 2-Acetylpyridine o-Hydroxy benzoyl hydrazone (APo-OHBH): Their Preparation, Characterisation and Antimicrobial Activity, Chemical Pharmaceutical Bulletin, 47(7), 944-949. Zhaoa, X.J., Du, M., Wang, Y. and Bu, X.H., (2004), Formation of cobalt(II)–piperazine supra molecular systems under different organic acid mediums: synthesis, characterization and crystal structures, Journal of Molecular Structure, 692, 155-161. Clemente, D.A., Marzotto, A., Valle, G. and Visona, C.J., (1999), Synthesis and structure of pseudo tetrahedral Co(II) zwitter ionic complexes: 4 trichloro(1-methylpiperazin-1-ium-N4)cobalt(II) and trichloro(1,4-4 dimethylpiperazin-1-ium-N4)cobalt(II), Polyhedron, 18, 2749-2757. Hou, Y., Wang, S., Shen, E., Wang, E., Xiao, D., Li, Y., Xu, L. and Hu, C., (2004), A novel three-dimensional metal-organic network, Zn2(btec)(pipz)(H2O)(btec=1,2,4,5 benzenetetracarboxylate, Pipz=piperazine), with blue fluorescent emission, Inorganica Chimica Acta, 357, 3155-3161. Cooks, D., (1961), Vibrational spectra of pyridinium salts, Canadian Journal of Chemistry, 39, 2009-2024. Nakamoto, K., (1997), Infrared and Raman Spectra of Inorganic and Coordination Compounds Parts A, Theory and Applications in Inorganic Chemistry, New York: Wiley& Sons Inc., 88-97. Ucar, İ., Bulut, A. and Büyükgüngör, O., (2007), Synthesis, crystal structure, EPR and electrochemical studies of copper(II) dipicolinate complex with 2,2′-dipyridylamine ligand, Journal of Physics and Chemistry of Solids, 68, 2271-2277. Kirillova, M.V.,Guedes da Silva, M.F.C., Kirillov, A.M., Frausto da Silva, J.J.R. and Pomberio, A.J.L., (2007), 3D Hydrogen Bonded Heteroneclear CoII, NiII, CuII and ZnII Aqua Complexes Derived from Dipicolonic Acid, Inorganica Chemica Acta, 360, 506-512. Kirillova, M.V., Kirillov, A.M., Guedes da Silva, M.F.C., Kopylovich, M.N., Fraústo da Silva, J.J.R. and Pombeiro, A.J.L., (2008), 3D Hydrogen Bonded Metal-Organic Frameworks Constructed from [M(H2O)6] [M'(dipicolinate)2].mH2O (M/M' = Zn/NiorNi/Ni). Identification of Inter calated Acyclic (H2O)6/(H2O)10 Clusters, Inorganica Chemica Acta, 361, 1728-1737. Nie, F.M., Dong, Z.Y., Lu, F., and Li, G-.X., (2010), Synthesis, structures, and magnetic properties of two pyrazolato-bridged trinuclear copper(II) complexes, Journal of Coordination Chemistry, 63, 4259-4270. ISNAD Büyükkıdan, Nurgün , Büyükkıdan, Bülent , Demir, Nedime , Karahan, Ceyda . "PİRİDİN-2,6-DİKARBOKSİLİK ASİTİN PROTON TRANSFER TUZU VE BUNUN Ni(II) VE Cu(II) KOMPLEKSLERİNİN SENTEZİ VE KARAKTERİZASYONU". 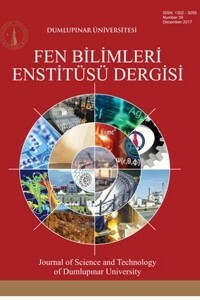 Dumlupınar Üniversitesi Fen Bilimleri Enstitüsü Dergisi / 041 (December 2018): 1-12.